Arteries are blood vessels that carry blood away from the heart. 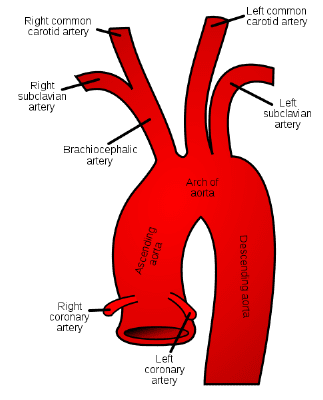 The brachiocephalic (Brachi-, -cephal) artery extends from the aortic arch to the head. It branches off into the right common carotid artery and the right subclavian artery. This relatively short artery supplies oxygenated blood to the head, neck and arm regions of the body.